…catchy title I know. Don’t steal it. Anyway, here’s some stuffs that have been turning the head of this hardened beauty addict recently. Are they any good? Dunno, but I’m gonna make it my business to find out! Originally designed to soothe and neutralize redness post laser treatments at the Dr. Ronald Sherman/Trish McEvoy Skin Care Centre, devotees begged to take home Trish’s wonder powder because of how remarkably bright and even-toned it rendered the overall look of their skin…. Blah, blah, blah whatever… you had me at even-toned. Not only are Elemis super-sizing their Pro Collagen Marine Cream this month, but I found this mega multi-use pairing on the website. A total 600ml of product would see me through to Christmas! Inspired by ancient Vietnamese beauty recipes, but made in France and new at Space NK, this little set of beautifully-packaged balms promise to fulfill life’s needs for on-the-go calming and healing. The set includes: Miracle Balm, Skin Balm, Hand Balm and Lip Balm. I like the idea of the set presented in a little coffret… it would make a lovely gift without breaking the bank. From the new Sun Drenched collection, this beautiful blue is my pick of the bunch. I swatched it the other day and it’s the perfect mid-toned summery shade that would work beautifully as an accent to a neutral eye. Lemming. I’ll be honest, it’s the case that’s pulling me in rather than the mascara. The copper casing can be refilled with the mascara units which are sold seperately at a cost of £12.99 each. What a fabulous idea no? What is it with The Body Shop atm? I can’t go on the website without buying something, anything! They’re spoiling us with discounts and I’m struggling to resist stocking up on essentials (and luxuries!) each time I log on. The Banana Shampoo from yesteryear is the only one from the “bring it back” range I’ve yet to try… better fix that sharpish! What’s on your radar this week? Reminds me that I need a refill for my Guerlain L’Heure Bleue. Apologies for my Hitler-esque grammar nazi tendencies…I love your blog though; I read it every day! Honestly- you crack me up, poor MR lipglossiping. totally agree with the Body Shop, I am not sure what happened but now I cannot keep away from the place! That mascara tube is so so eye-catching! I’ve found myself wanting a lot from The BodyShop too! I’ve recently ordered passion fruit cleansing gel, cleansing facial soap, facial brush and blackhead remover. All with great reviews, they should be arriving tomorrow! I have that shampoo and it smells SO good. Although only good if you like the smell of bananas. Possibly the most stupid thing I’ve ever said in my life. Anyways, I loove it, especially at 30% off! I approve Laura Mercier Luster Eye Colour in Marina 😉 And I would like to try # 3. As for my list – it’s waaaay too long, as usual! 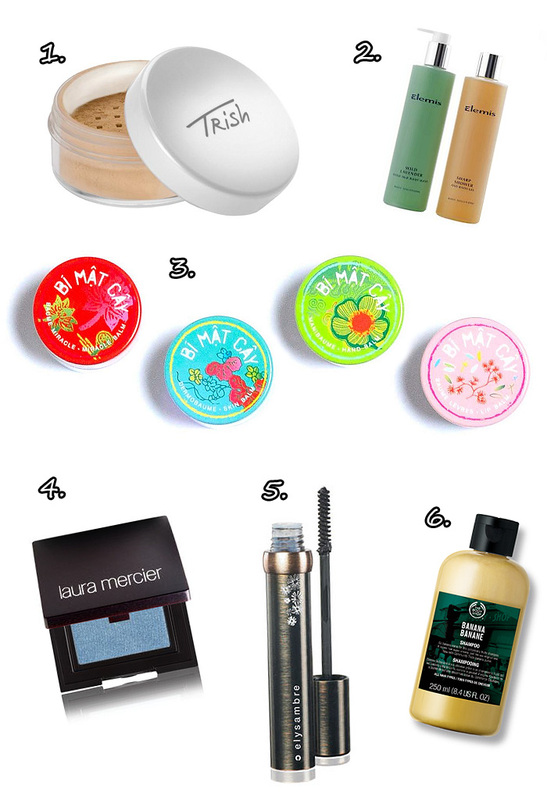 That Trish McEvoy Correct and brighten Loose Mineral Powder is on my list to buy, I’m waiting for them to be online for us in the UK,its meant to be June so hopefully won’t get delayed. I’ve not bought from the Body shop in ages, always seem to get jumped on when I go to one of their stores. Damn you, loving the sound of the banana shampoo: right down my alley. A bit sceptical though. I think as long as it lathers ok, and hair doesnt feel too dry, it will be ok. you re such a temptress. That powder is a brilliant idea I tell you! Er..not that you needed me to tell you or anything! Also, when I was getting my laser treatment done I was told to just use Simple because it was the best and I have to say that it was, it never gave me any aggravation or anything, I used a Garnier cream which stung me so I learnt my lesson. Also, to those asking about the banana shampoo..I found it to be ok at best, it made my hands really sticky after washing them and I don’t think it did much for my hair..plus it smelled funny..as in synthetic banana meets dirt. That mascara case is beautiful too! Deal Alert: Free Mavala Nail polish with next month's Elle magazine!